We're very excited to share our newest Solar Star garden stakes! This patriotic set of solar starburst stakes is like a 4th of July celebration in your garden every night! If you need something extra special, these new Patent Pending Motion LEDs will be like nothing else in your solar garden. Multiple LEDs line each stake and light upwards like a rocket ship of building excitement over and over again! 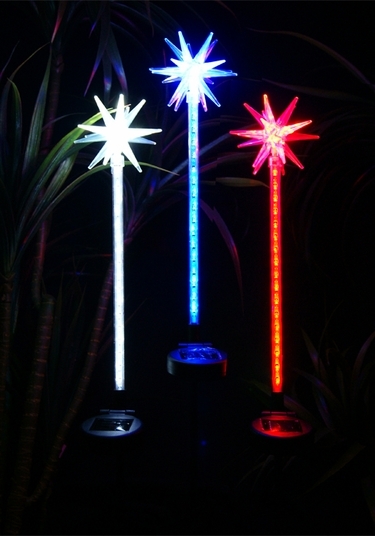 Set includes 1 Red, 1 White, & 1 Blue Solar Star Motion LED Garden Stakes.